A research team led by scientists in Dr. Andy McMahon’s lab at the Broad California Institute of Regenerative Medicine at USC, has discovered the crucial role that the Sox9 gene plays in kidney repair after acute kidney injury (AKI). The work of lead author, Sanjeev Kumar, M.D., Ph.D., was funded by a UKRO John McKay Fellowship grant, awarded in 2012. 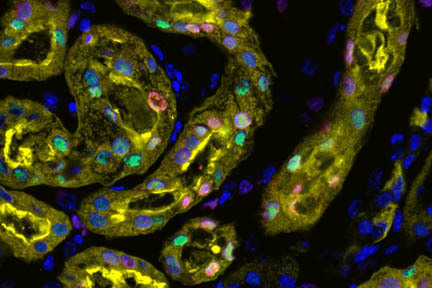 Following AKI, an intrinsic healing process occurs as surviving tubular epithelial cells begin to proliferate and repair the nephron. The scientists found that Sox9, a key gene in kidney development, is activated early in these surviving cells and in fact, stirs them to kidney repair. It is essential to the normal recovery process after AKI. Sox9 can remain activated, even after kidney function is restored, revealing sites in need of further repair. Remaining Sox9 activation after injury could be an early indicator of future CKD and possible progression to kidney failure. acute kidney injury, Sox9. Bookmark.